The holidays make me think of my favorite food group: APPETIZERS!!! I thought it would be great for us to share our favorites and get ideas for our Christmas parties and parties throughout the year! My mom used to always make these at the holidays. They are SO addictive. She used to send me back to college with a huge tin of them and I won't tell you how long they lasted. They are the BEST snack. In a mixing bowl, whisk together vegetable oil, ranch-style dressing mix, dill weed, lemon pepper and garlic powder. Pour this spice mixture over the crackers in a medium bowl, and stir until the crackers are coated. 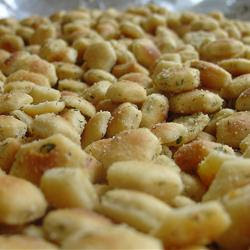 Arrange the crackers on a large baking sheet. Bake in the preheated 275 degrees F (135 degrees C) oven for 15 to 20 minutes. In a medium bowl, beat together cream cheese and butter until smooth. Mix in confectioners' sugar, brown sugar and vanilla. Stir in chocolate chips. Cover, and chill in the refrigerator for 2 hours.